Another music phenomenon, Bess Lomax Hawes, sister of the music historian Alan Lomax, arrived in California in the fifties and began teaching guitar and repertoire workshops at UCLA and what was the San Fernando Valley State College. She had a method of teaching thirty to forty students to successfully play the guitar. Some of them, such as Mary Ellen Clark, also became teachers and members of Songmakers, and Mary Ellen and a number of her students of are still Songmakers. Another student, Nick Steed, organized small song circles to practice the songs they were learning. His group of three grew to become the West Valley Guitar Group. In time, they merged into the San Fernando Valley Branch of Songmakers, vitalizing and enriching the organization. Musically, these were rich years with several hoots, and performing, writing, teaching and hoot-leading workshops. Songmakers has withstood several political battles and some downtimes when membership lessened, but the love of music and continued supply of individuals dedicated to preserving this organization while having a good time making music, keeps us singing and growing. Over the years Songmakers has evolved into more of a mutual support group for songwriters, musicians and singers wanting to improve their craft, meet other like-minded folks, play lots of music together, and generally have a lot of FUN! After Songmakers was incorporated in the ’60s as a non-profit organization a set of by-laws was adopted, a board of directors was formed, and a more formal organizational structure was thus adopted. We don’t let that interfere with our FUN, however! 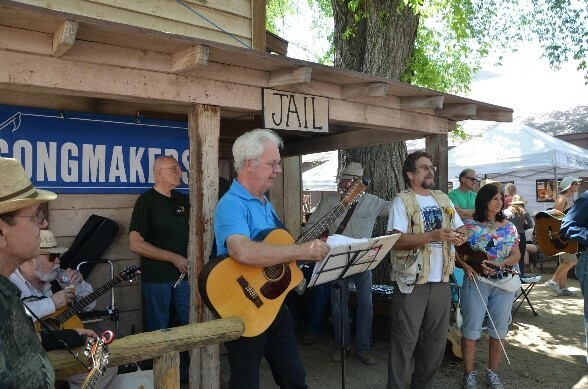 Songmakers is somewhat like a folk music club, except that (we feel) we welcome and embrace a more eclectic mix of musical genres and styles, such as country, oldies (from the 20’s through yesterday), bluegrass, gospel, blues, humorous songs, and of course folk. The only common thread is that everything we do is acoustic (with the exception of occasional performances before large groups) and FUN! We currently have about 450 members. Hoots, Song Circles, musical get-togethers and attending other musical performances and events is what Songmakers is all about. Our members are musicians ranging from beginning to professional and just plain folks that love traditional and acoustic-style music. A Hoot is an official chapter of Songmakers and so is governed by the board as a sanctioned get-together, usually at a private home and attended by an average of 10 – 20 people. Everyone gets one or more turns at which time they may either Perform a song, lead a sing-along song, request a song or performance by someone else, or simply “Pass.” Larger venues sometimes exceed 30 people and when this happens, the group will break down into smaller circles. Hoots are held each month in locations from Orange County to Ventura County. Song Circles are similar but are not bound by Songmakers Hoot policy guidelines as they are considered private parties. See the Hoots page for the schedule of current hoots and Song Circles.